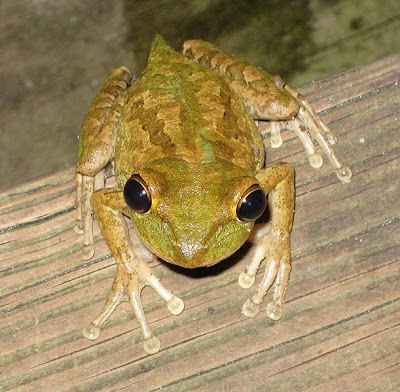 "This is a Cuban tree frog on a tree in my backyard in southern Florida. How and why he ate this light is a mystery. It should be noted that at the time I was taking this photo, I thought this frog was dead having cooked himself from the inside. I’m happy to say I was wrong. After a few shots he adjusted his position. So after I was finished ... I pulled the light out of his mouth and he was fine. Actually, I might be crazy but I don’t think he was very happy when I took his light away." 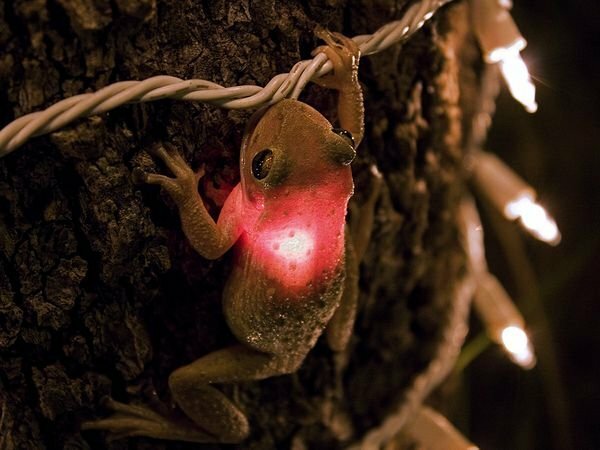 So I was curious...what does a Cuban Tree frog look like unlit from the inside? So if he swallows a light, he's red and green...the colors of Christmas! To read more about some really strange and amazing frogs, just click here. Oh my goodness, that's the weirdest/most hilarious thing! Haha, that's the best picture *ever*!